My camera’s on/off switch went wonky a few weeks ago—I had to hold it in the “on” position with my finger to take photos. It was a 2015 Christmas gift and two months out of warranty (of course) and the repair-shop estimate came back at nearly half the cost of a whole new camera (of course again). So it sat on my desk and stared at me with its one giant eye day after day while I debated its fate. Tuesday, in a hail-Mary sort of move, I reached out to its manufacturer via Facebook and explained that while the warranty had definitely expired, the camera was too new to require an expensive repair, in my opinion, and I hoped they would help. Then I braced myself for a “go away, kid” canned response. Instead, a representative replied that he agreed with me and that he was sending me shipping materials to pack my camera up for a repair on them. He followed up with an email to the same effect and then sent me tracking information for the package, which arrived yesterday. If all goes well, I should be back to snapping photos in about two weeks. 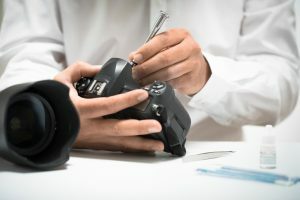 The company didn’t have to fix my camera–it was legitimately out of warranty and well within their right to say no. But it doesn’t cost them much to help me out, and saying yes (and doing it quickly) earned my loyalty for a very long time. Not a bad investment.